A Canadian man held hostage for five years in Afghanistan has gone on trial accused of sexual assault, unlawful confinement and other offences. 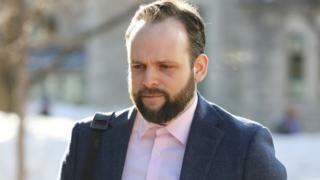 Joshua Boyle, 35, has pleaded not guilty to all 19 charges against him. A court-ordered publication ban was lifted on Monday to reveal that one of the alleged victims is his estranged wife, Caitlan Coleman. Pakistani soldiers rescued Mr Boyle, Ms Coleman, and their three children in October 2017. Mr Boyle appeared in the Ontario court on Monday accompanied by his father. Ms Coleman, who is American, did not attend the hearing but is due to begin giving testimony on Wednesday, Canadian broadcaster CBC reported. The charges Mr Boyle faces include assault, sexual assault, unlawful confinement, uttering death threats and criminal harassment. Police say all the alleged offences occurred after Mr Boyle and his family returned to Canada in 2017. The identity of the second alleged victim remains subject to a publication ban. Mr Boyle and Ms Coleman were kidnapped while backpacking in Afghanistan in 2012 by the Taliban-aligned Haqqani network. She gave birth to their children while in captivity. After their release, Mr Boyle said their captors had killed a fourth child. Their rescue made headlines around the world and on their return to Canada the family was invited to meet Prime Minister Justin Trudeau. But less than three months later Mr Boyle was arrested and charged. He has been under house arrest since June 2018.